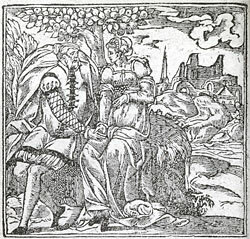 Alciato at Glasgow: Emblem: Le Vieillard Amoureux. Section: AMOUR. View all emblems in this section. Ainsi la garse est chez ce vieil yvroigne. debvoir de Fortune, & Nature. 1. This woodcut is also used in 'Sur la foy de Mariage' ([A58a180]). 2. A story taken from Athenaeus, Deipnosophistae, 13.592b. Sophocles is the great tragic poet, of whom several such tales were told. He made Aganippe the beneficiary under his will.